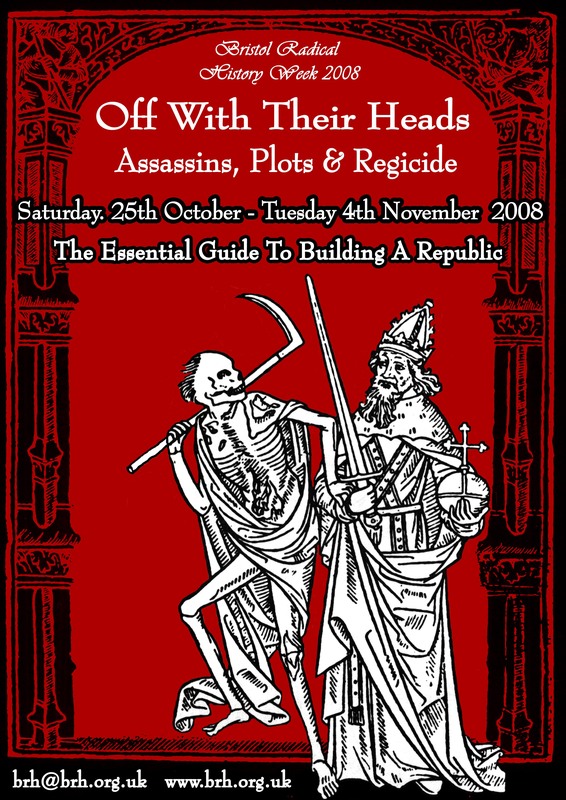 For Bristol Radical History Week 2008 we turn our attention to three connected themes which have sent shivers down the spines of our rulers whether monarchs or ministers for a millennium...Regicide, Republicanism and Political Assassination. As the first people in modern times to have both created a Republic (hussar!) and tried and executed a traitorous king we have both an interesting and progressive history to explore. Starting with this momentous moment, The English Revolution, we will chart some of the radical currents that drove a dispute over the division of political power into a full blown revolutionary war where the people's army often dictated the terms of the new Republic and decided to challenge the God's by seizing the King and putting him on trial for war crimes. With the torch of political freedom lit by the short lived but influential Republic (after all things are never the same again after you've carried out your first regicide!) we march onto the birth of modern Republicanism in the flames of the American and French Revolutions of the late 18th Century. It has always intrigued us why no one seems to know in England who Thomas Paine is or what he proposed. In the late 18th Century the man's name was on everyone's lips, whether frightened monarch, angry cobbler or mutinous sailor. We shall be looking at the debates that broke out in the fledgling English republican movement between old style 'Norman Yokists' , looking back to a mythical past and those who grasped the new enlightened ideas from the colonial upstarts and French revolutionaries. We will consider how the ideas of Paine and the French and American democratic models frightened our rulers and both inspired and divided the English Republicans as they stumbled down the insurrectionary path. In the late 19th Century, if you were a king, a president or a capitalist then the chances were that there was some Anarchist or other who was trying to waste you with bomb or bullet. We will look at the rise of the propagandists of the deed, desperate (but well dressed) men and women who had decided enough was enough and had taken justice into their own hands. From Alexander Berkman to the unmasking of the true identity of Peter the Painter we will survey the wreckage of a period where the decadence of the wealthy and powerful often paid its price. Well it's better than bottling it up! 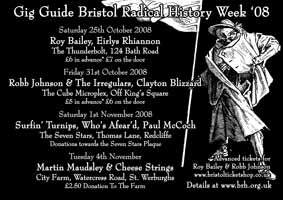 Bristol Radical History Week 2008 is not just about lectures and debates, we our usual mixture of great gigs , our popular history walks, a recreation of a regicide, opening the archives and its all rounded off with a bonfire night of stories, toffee apples and effigy burning! 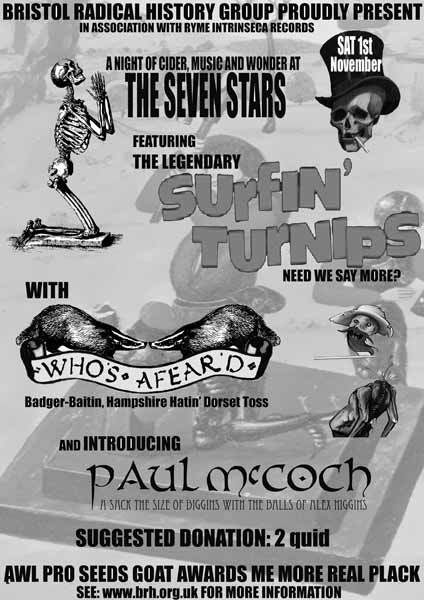 Listen to a BCFM interview (8 MB 17 mins mp3 file) were Roger covers the events of Off With Thier Heads. 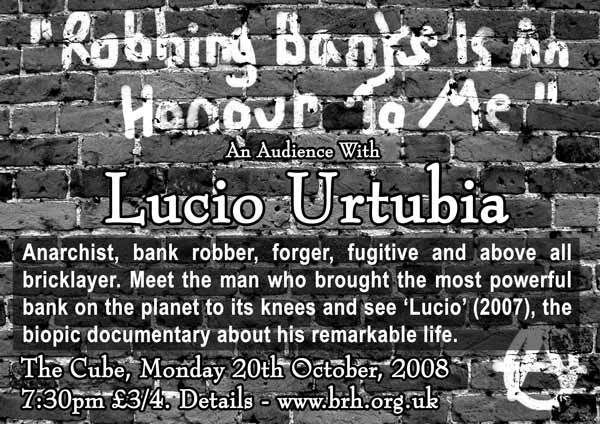 An appetiser has been added to the programme for Bristol Radical History Week on Monday 20th October (details below). Please note that this event has been added at the last minute and does not appear on the printed programme. Mon 27th Oct. 7:30pm Regicide And The English Revolution Geoffrey Robertson - The Tyrannicide Brief. Tue. 28th Oct. 7:30pm Political Assassins Matt Carr - Avengers & Madmen - Propagandists Of The Deed & The Dawn Of Modern Terrorism. Sat. 1st Nov. 3:00pm Radical History & ‘The Commonweal’ David Cullum - Why History Matters... And Why. T'bolt = The Thunderbolt, The Olde Turnpike, 124 Bath Road, Totterdown. Bridewell = Island @ Bridewell Fire Station, entrance on Silver Street between Nelson Street And Rupert Street. Please note that this is not the same enterance that we used in May. PCC = Pucklechurch Community Centre, New Village Hall, Abson Road, Pucklechurch. CenRefLib = The Bristol Room, upstairs at Bristol Central Library, College Green. UWE = The Lady Chapel, University of the West of England, St Matthias Camps, Oldbury Court Road, Fishponds. St WB CF = St. Werburghs City Farm, Burning Wells, Watercress Road, St Werburghs. *The Cube is a membership only cinema. You will need to pay £1 for a life time membership the first time you visit. Remember to bring your membership card every time you come to an event here. ‡This event was added at the last minute. Please note that this event has been added at the last minute and does not appear on the printed programme. Download a printable programme of events here (1.5MB PDF file), 2 sides of A4. 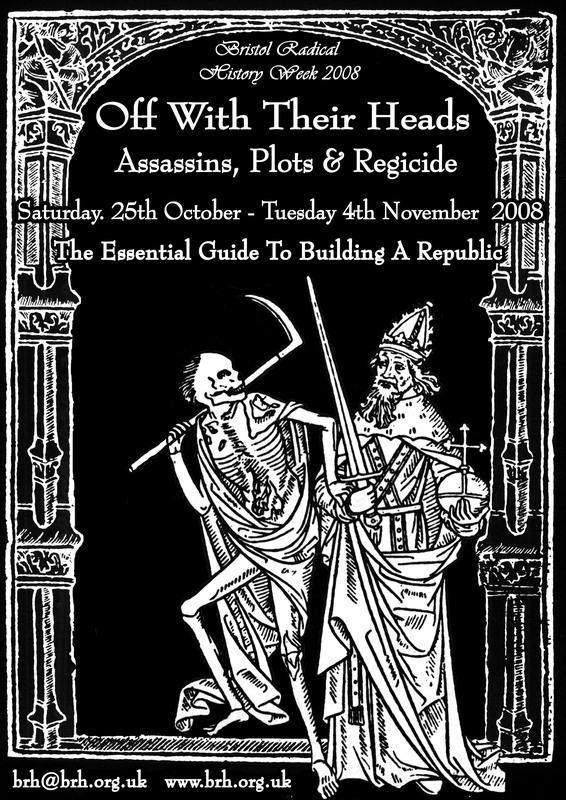 Download a colour poster for Off With Their Heads here (1.5MB jpeg file). To preview the poster click on the thumbnail below. 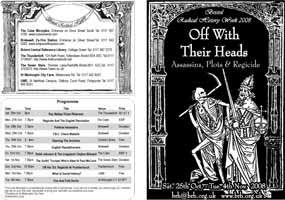 Download a black & white poster for Off With Their Heads here (1.5MB jpeg file). To preview the poster click on the thumbnail below. 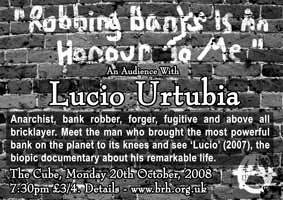 Download a black & white A6 flyer for the Lucio Urtubia here (750KB pdf file). To preview the Flyer click on the thumbnail below. 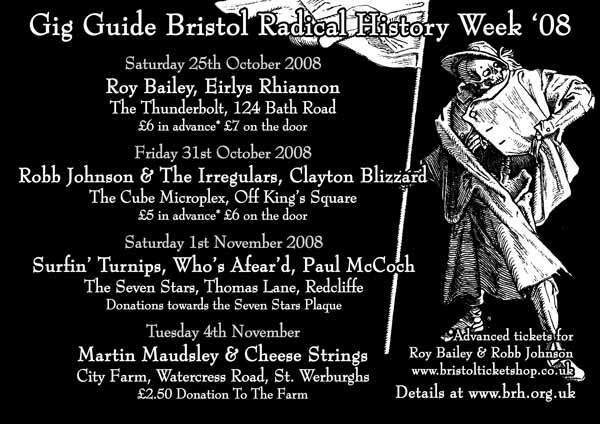 Download a black & white A6 flyer for all 4 Radical History Week 2008 gigs here (300KB pdf file). To preview the Flyer click on the thumbnail below. Download a black & white flyer for the Seven Stars gig on the Saturday 1st November here (500KB jpeg file). To preview the Flyer click on the thumbnail below.